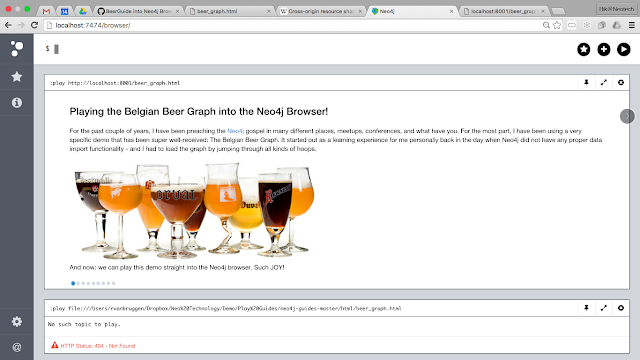 Bruggen Blog: The BeerGraphGuide in the Neo4j Browser: the making of! The BeerGraphGuide in the Neo4j Browser: the making of! 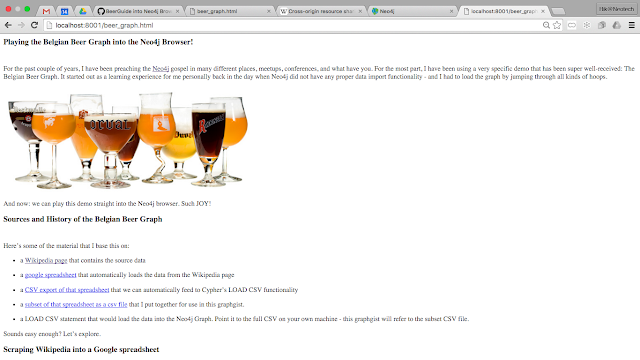 So last week I showed off this little tidbit that I created with the help of Michael and Oskar - a BeerGraphGuide right into the already fabulous Neo4j Browser. So obviously I need to explain HOW I created that - and that's what I will do in this blogpost. 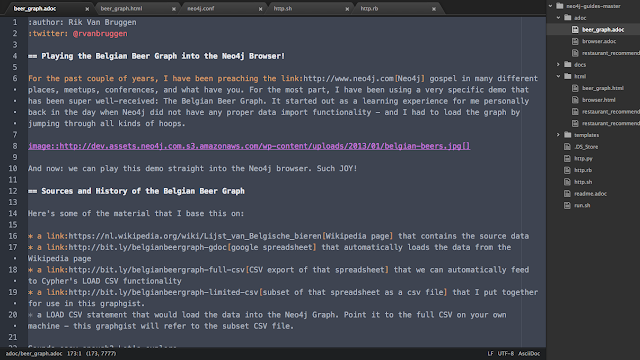 Creating a Browser Guide - easy! we need to create an Asciidoc file (identical to what we use for our GraphGists) that describes the Neo4j Browser Guide. we need to convert that Asciidoc file to an HTML file with a very simple shell script (see below). So let's get cracking with that. within each pane you create further subdivisions with a "===" marker. 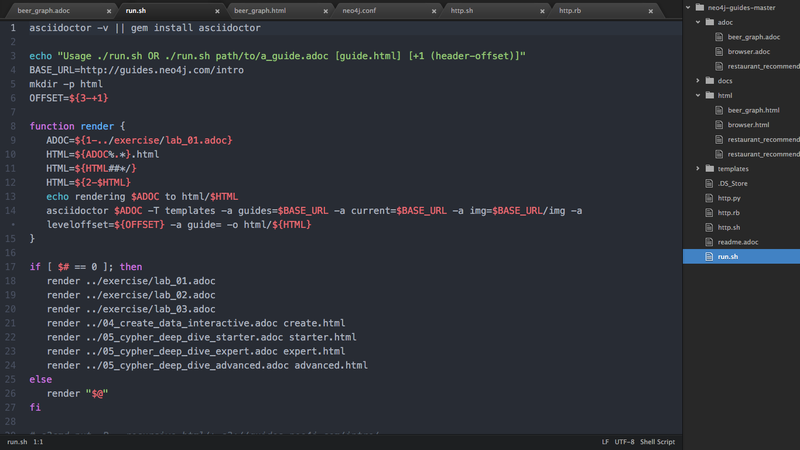 Next up: converting that into an HTML document. 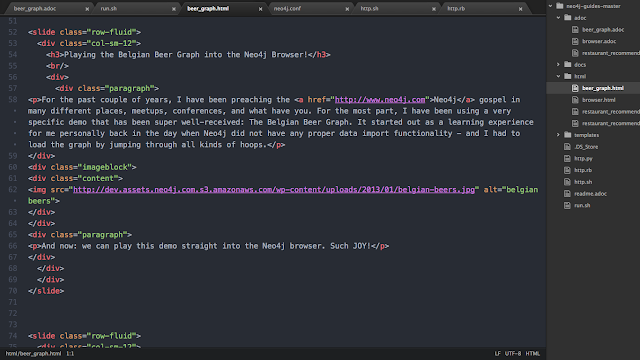 You can find the generated HTML file on github as well, if you would just like to grab it and go from there. You will see that this file uses a "slide"-layout CSS which is then used by the browser to turn it into a slideshow. Now, if you would just be opening the html file locally into your browser from your filesystem, you could already get a good sense of what is going on. Now all we need to do is figure out a way to get that to load into the Neo4j browser. 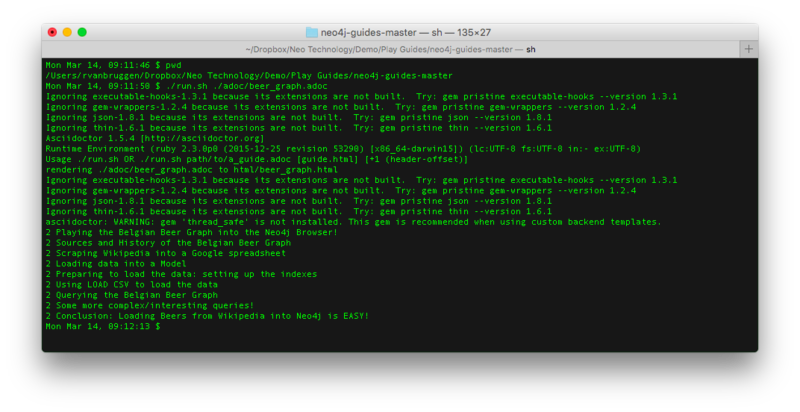 So: next, you need to download the latest and greatest version of Neo4j from over here (I used the 3.0M05 Enterprise version just because... I am an adventurer, you know!). 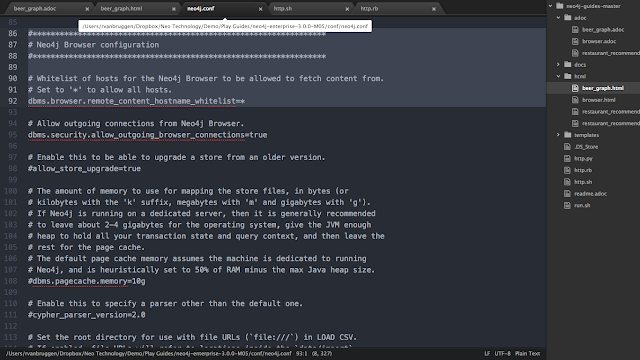 You should install it, make sure it's running and that you can access it on http://localhost:7474 (or whatever address you are using), and then shut it back down. and set that to "*" as below. This basically does what it says: it allows the browser to fetch other content from "foreign" URLs. # Whitelist of hosts for the Neo4j Browser to be allowed to fetch content from. # Set to '*' to allow all hosts. and on that webserver, we need to enable the Cross-Origin Resource Sharing feature so that the browser would not complain about mixing different sources of content in one web page. Not trivial? Well, no - but if I can do it you can do it. 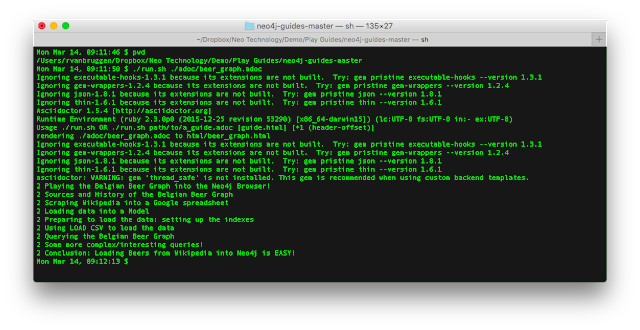 Note: Oskar told me that very soon, Neo4j will be offering a contrib repo on Github where people can create pull requests with their general guides - and which will then automatically by published on guides.neo4j.com. Also: you can host a website on an Amazon S3 webserver that has configurable server headers - so guides would be playable from there too. ./http.rb, a Ruby Sinatra application that does the same. You are best starting it by running ./http.sh , as that will also install the Sinatra gem for you. I am sure there are plenty of other ways of doing the same, but if I just run ./http.sh things automagically start happening. 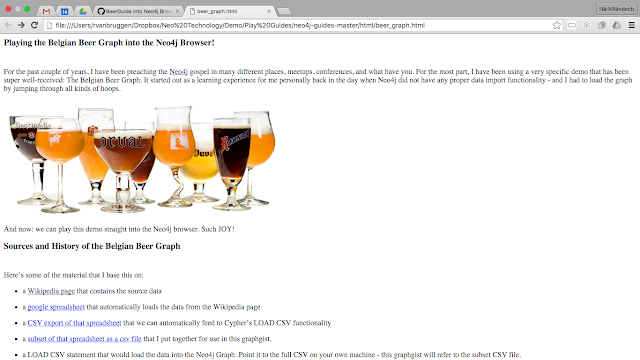 As you can see above, the webserver is alive and serving pages on port 8001 of my localhost, which I can test really easily by going to the http://localhost:8001/beer_graph.html page. And yey! It works! This means we should be ready to test our BeerGraphGuide in the Neo4j browser too. 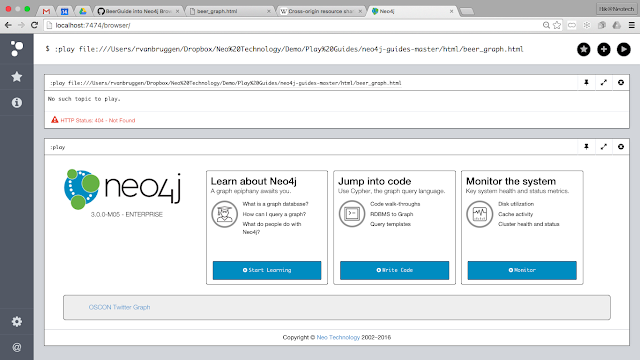 And a new :play pane will appear that interpretes and reformats the HTML page above, and shows it in the specific format that we know and love for the Neo4j browser panes. That is what I call a RESULT! It totally works, and I can think of a zillion different use cases for this mechanism - and I am sure you can do the same. Hope you guys like this experiment - and I am looking forward to many more in the future!